Rolle, Switzerland : Nissan unveiled the NISMO smartwatch concept on Monday – 9th September, 2013. • Monitor the efficiency of their vehicle with average speed and fuel consumption readings. • Access vehicle telematics and performance data while on track. • Capture biometric data via a heart rate monitor. • Connect to the car using a smartphone app via Bluetooth Low Energy. • Receive tailored car messages from Nissan. 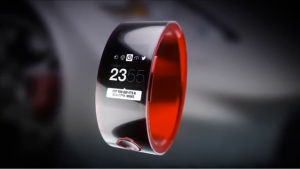 The NISMO Watch will also track and rate the user’s social performance across Facebook, Twitter, Pinterest and Instagram via Nissan’s proprietary Social Speed software. The watch design was inspired by the NISMO ring and is reflected in a seamless, futuristic and ergonomic design. The simple user interface can be controlled by two buttons and is secured onto the driver’s wrist via a simple snap-fit mechanism. Even the packaging will have a unique NISMO identity. The NISMO Watch will use a lithium battery and will be charged by micro-USB, with a battery life of over seven days under normal usage conditions.